The Mstislav Rostropovich collection. 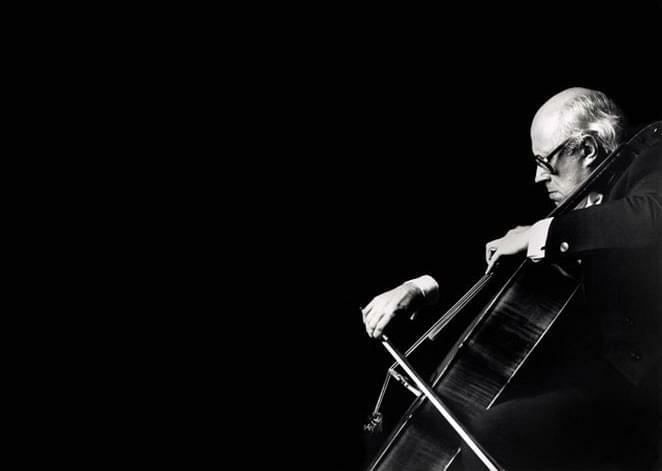 Cellist Mstislav Rostropovich was born in Baku, Azerbaijan in 1927, growing up in the Soviet Union. He is regarded as one of the greatest cellists of the 20th century. G.B.Guadagnini is regarded as the finest of the late classical Italian school of violin makers. His career began in Piacenza in about 1740, a crucial period in nearby Cremona, where Stradivari had died three years previously. By 1747 both of the other great Cremonese makers, Guarneri del Gesù and Carlo Bergonzi, were also dead. Quite suddenly Cremona had lost its pre-eminence in the craft, and the future development of lutherie seemed quite fragile. It was Guadagnini who took on their mantle. Despite the proximity of the two cities, there is no evidence that Guadagnini received any direct training from Cremonese (or any other) violin makers, which makes his work all the more remarkable. What is known is that from a very early stage he was working closely with musicians, most importantly the Ferrari brothers, the violinist Paolo and cellist Carlo. Guadagnini’s life was to become a series of movements, from Piacenza to Milan, from Milan to Parma, and eventually from Parma to Turin, where he died in 1786, pursuing work and patronage. His friendship with the cellist Carlo Ferrari remained a constant factor until he left Parma in 1771, and in important ways was pivotal for his career. 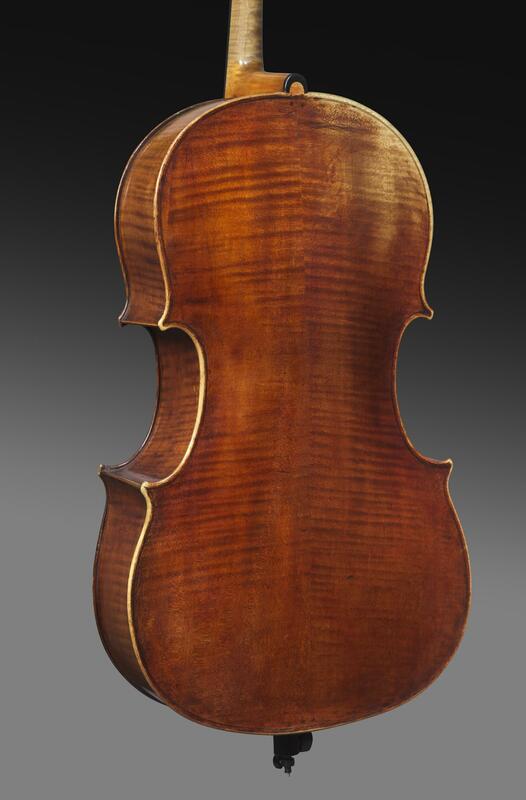 Guadagnini’s very earliest work in Piacenza focussed on cellos, and throughout his life he developed new approaches, generally with the aim of making a more compact soloists’ instrument, livelier and more nimble than the great basses of the past, which had back lengths in excess of 77cm. The difficulty facing all cello makers is in keeping the depth and richness of the lower register in an instrument of smaller physical size and reduced air volume. Guadagnini’s work in general is marked by an original approach to all things, not just in the detailed finish of scrolls, purfling and soundholes, but in developing performance qualities, and in this, his close association with musicians is evident. Guadagnini’s great cellos can be as small as 60cm in back length, but the reduction is compensated for by generally inflating the shape of the arch, giving a larger vibrating wood surface and maximising internal volume. 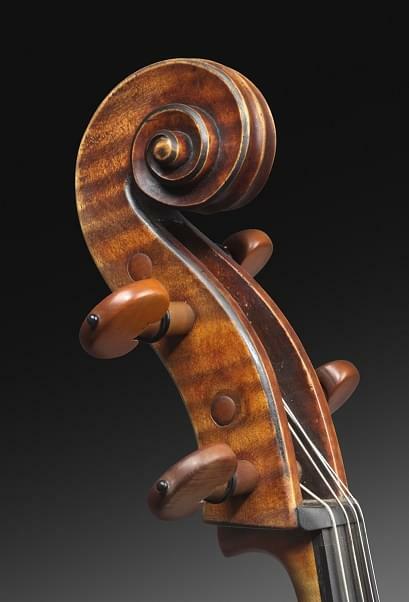 The Mstislav Rostropovich collection’s Guadagnini cello of 1783 is one of the Italian luthier’s last and most noble works. The instrument seems to contain all of Guadagnini’s own artistic ideas about the cello, but overlaid with the clear signs of the influence of his patron, the renowned collector Count Cozio di Salabue. Cozio’s enthusiasm for Stradivari was resented by Guadaginini, who had consistently followed his own course, but nevertheless many of his late Turin works, like this cello, are marked, at Cozio’s insistence, by the blackened edges to the scroll, an idiosyncrasy of Stradivari’s that is at odds with the various personal touches of Guadagnini’s own independent spirit. It remains a powerful work, beautifully modelled and in proportion not unlike the work of the great Venetian cello maker Domenico Montagnana, but significantly reduced in scale. The soundholes are also Stradivarian in form, but set widely on the broad face of the instrument. Guadagnini’s varnish varied considerably depending on his location, and this dark, intense red-brown is characteristic of his Turin period, and still beautifully intact on this wholly remarkable cello. Santo Serafin is one of the best-known of the many great violin makers who worked in Venice throughout the eighteenth century, but he stands significantly apart from his contemporaries in almost all aspects of his work. Highly prolific in his production of violins, his cellos are exceptionally rare. Serafin came to Venice in 1717 from neighbouring Udine, where he was born in 1699. After presumably serving an apprenticeship with one of the existing workshops in the city, he began labelling his own instruments in 1725. His induction into the Musician’s Guild in 1733 allowed him to establish his own premises in the Calle dei Stagneri in that same year. Unusually amongst luthiers of the period he retired from business after some eleven years, but he continued to make instruments until at least 1758. His work is characterised by fastidious craftsmanship, a trait not so common amongst Venetian makers, and a well-regulated model following Amati patterns. He seems to have enjoyed extending the more decorative elements of the scroll and purfling into discreet displays of skill and markers of his own personal hand, with elements of technique that are not found in other makers’ work. Almost invariably, his instruments are clothed in beautifully applied rich red varnish that is a shared feature of most Venetian makers. 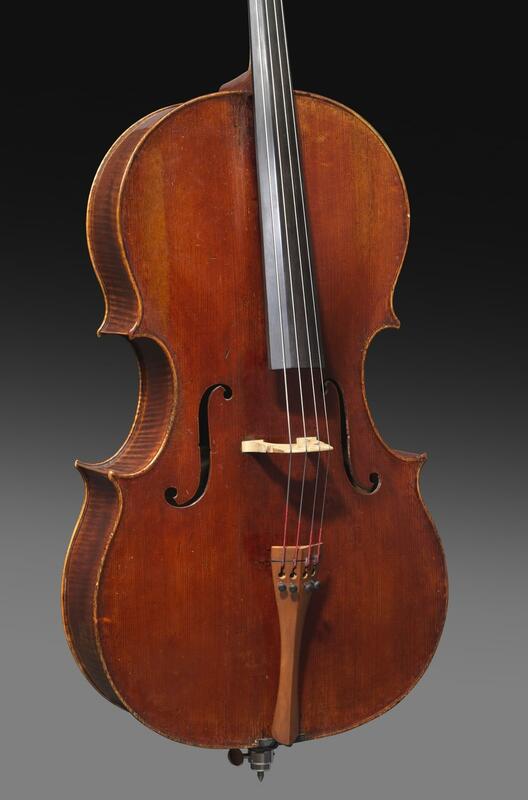 This cello of circa 1741 from the Rostropovich collection is a very rare gem. The makers in Venice, a well-supplied centre of eighteenth century trade, do seem to have had an enviable choice of materials, and the wood and varnish are quite breathtaking in quality. What is striking about the form is how much it resembles a scaled-up violin rather than a cello, with long and very elegant corners that almost seem a little out of proportion. The soundholes are distinctively slender, with relatively small finial circles, and it is in the scroll that Serafin’s clearest signature can be discerned, in the tightly controlled spiral extending slightly further behind the eye than is common. From the distinctively ornate printed label to the vibrantly coloured varnish, this cello is a singular piece of superb and flamboyant craftsmanship. Click here for more information on Sotheby’s website.